Despite common concerns regarding safety, credit cards remain the most popular way to make payments, purchases and deposits on the Internet, but can you use credit cards to place real money bets on esports events online? We look at the credit card deposit options offered at leading esports betting sites to determine whether Visa and MasterCard deposits make a good choice for funding your esports account. Credit card deposits continue to be favoured by online players because they are simple and familiar. Unlike web wallet services, bitcoins or other online banking systems, no additional accounts or sign-ups are required and all you need to do to make a deposit to your esports betting account is enter your credit card information just like you would if making any other purchase online. To bet using your credit card, you will need to find a safe, reputable esports betting site that accepts credit card deposits. We’ve provided some information below about the best esports betting providers that accept credit and debit card deposits and the terms and conditions of each. Can Americans deposit using credit cards? Due to the strict online gambling laws in the USA which prohibit payment providers from allowing payments to online gambling sites, American esports fans are often limited for choice when it comes to the deposit options available. However, we have noticed there are certain stipulations listed at some of the top-rated esports betting sites that provide a way for American players to deposit using credit cards. For example, at betting sites like Bovada, you can use MasterCard, Visa and some Visa Gift Cards to fund your esports betting account, but you must make sure the gift card is allowed to be used for ‘International and Online Purchases’ prior to buying it, otherwise it will not work. If you have any questions about the payment options available to you, we suggest you check with the customer service teams using the live chat function at our endorsed betting sites. Before you decide whether a credit card is the right deposit option for you, you should be aware that most credit card issuing financial institutions process payments made to gambling sites as “cash advances.” Cash advances typically come with fees attached, so you may be hit with some extra charges for depositing with your credit card. The fee schedule for cash advances varies between credit card provider, so you should double check with your bank before making your first credit card deposit for esports bets. Your bank may also charge international transaction fees on deposits depending on the accepted currency at your chosen sports betting site. International transaction fees are typically capped at 3% but may vary slightly between banks. It is up to you to be aware of any additional fees imposed by your banking provider for credit or debit card deposits – the online bookie will not be able to help you with this information. Can I deposit with a debit card? A majority of online esports betting sites that accept MasterCard or Visa credit card deposits will also accept deposits using a Visa or MasterCard debit card. Making a payment with a debit card works in the same fashion as a credit card deposit, but instead of accessing a line of credit you are instead betting with your own money. For this reason, debit cards are recommended where possible, as they support much more responsible gambling practices and ensure you won’t fall into debt placing bets online, ensuring you bet within your means. MasterCard is one of the worlds most trusted payment methods and is widely accepted at online gambling sites, including esports betting sites. Deposits can be made using MasterCard credit cards, debit cards, pre-paid cards and gift cards, with transactions protected by MasterCard’s Zero Liability protection policy. Like MasterCard, Visa is a globally recognised, trusted and accepted credit card provider and is widely accepted at reputable esports betting sites. Deposits can be made using Visa credit, debit, pre-paid and gift cards, with all transactions protected by stringent security measures and the optional Verified by Visa password authentication process. To make a credit card deposit to place bets at an esports betting site, there are a couple of things you need to do. 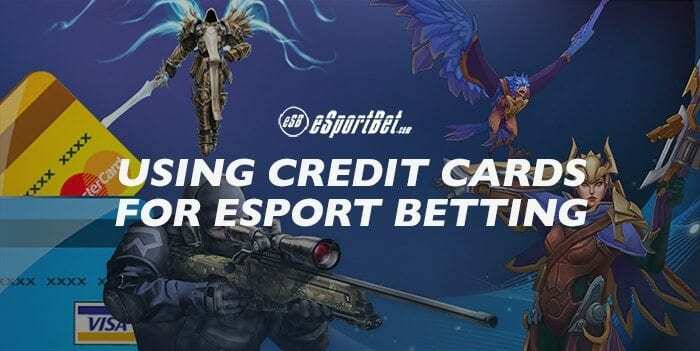 First, you need to sign up for an account with a reputable esports betting site that accepts deposits using your chosen credit or debit card provider. Second, you need to make sure your credit card has access to an adequate line of credit or that your debit card has adequate funds available. Third, you need to make sure your credit card provider allows payments to be processed to online gambling sites, as some financial institutions have restrictions in place from gambling with a line of credit. Depending on the betting site you are using there may be some slight discrepencies to these instructions, but this is generally the process to follow to make a real money credit card deposit. Deposits made using Visa and MasterCard are processed on the spot, so you will be able to start placing real money bets on your favourite esports games immediately. Note that transaction fees, currency conversion fees and deposit limits vary between each online sports betting site. Always read the banking terms and conditions or check with a customer service operator so you’re aware of the fees applicable to you. Is it safe to deposit with a credit card? Visa and MasterCard are two of the most trusted financial brands on the planet. Not only do both of these companies have a strong global presence and shining reputations for user security, they also have strong regulations in place to ensure the privacy of their customers. Both Visa and MasterCard have anti-theft and anti-fraud provisions in place, and in the unlikely event that your credit card details were to fall into the wrong hands, both brands have processes in place to return your money and ensure you aren’t liable for any unauthorised transactions. These security measures coupled with the fact that the best esports betting sites are protected by a minimum of 128-Bit SSL (secure socket layer) digital encryption security ensures you can place real money bets with your credit card without concerns for your safety. As always, make sure you are betting using a secured Internet connection and avoid shared or public Wi-Fi when entering your credit card details online.